Old school toys for the technical minded. Our Meccano collection is the latest addition to the museum. People have made all sorts of things from Meccano and we can show you just what. Two examples are a Meccano Eifel tower that has an elevator that moves up and down and a Ferris wheel with lights and two wheels that rotate separately from one another. Apart from the lose pieces we have also complemented our other collections with Meccano pieces. 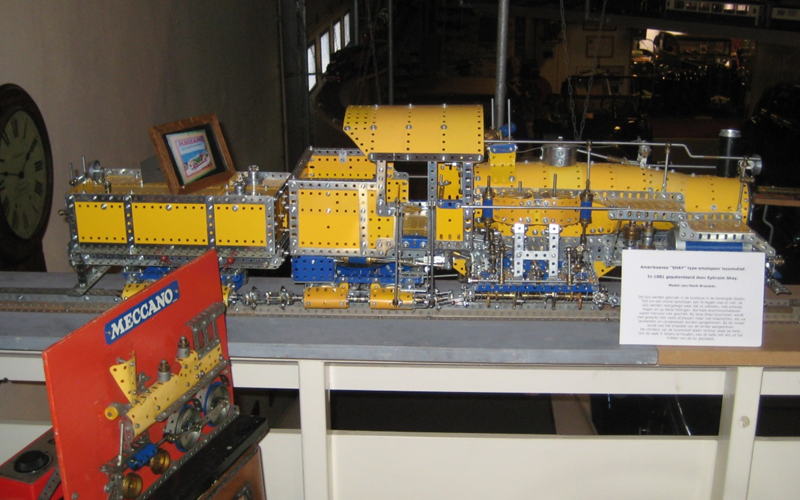 For example: we have a Meccano Bugatti in our car collection, a Meccano radio for the radio collection and a unique Meccano train that was built in a period of six months. Most of our Meccano pieces were used in store windows or for other promotional purposes. This means that the pieces are of a high quality with many moving parts. Let us surprise you with this beautiful collection of old toys!